You can use this conversion kit to adapt Ford or GM alternators on applications with double mounting legs commonly found on import vehicles and some later model domestic vehicles. 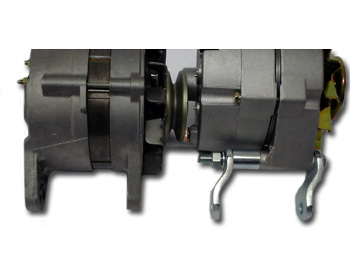 The brackets are offset and can be used in a number of configurations in order to get the correct mating between the OEM bracket and replacement alternator. Comes complete with spacer shim and a number of different sized washers. Contact us if you are not sure if this kit will work for your application.